I spotted this new find at Costco a few weeks ago. To my chagrin, I also realized that at least one of the stores stopped carrying Rudi’s bread. I looked at this new bread dismissively and found another Costco that had Rudi’s. But then curiosity won over and I picked up the new bread on my recent visit. After all, all promising GF products deserve a chance, right? I tried it regular and toasted, made a grilled cheese sandwich, and a regular sandwiches for V’s lunch. And I am glad I gave it a chance. When they say “super seeded”, they really mean it. There are lots and lots of sunflower and flax seeds. 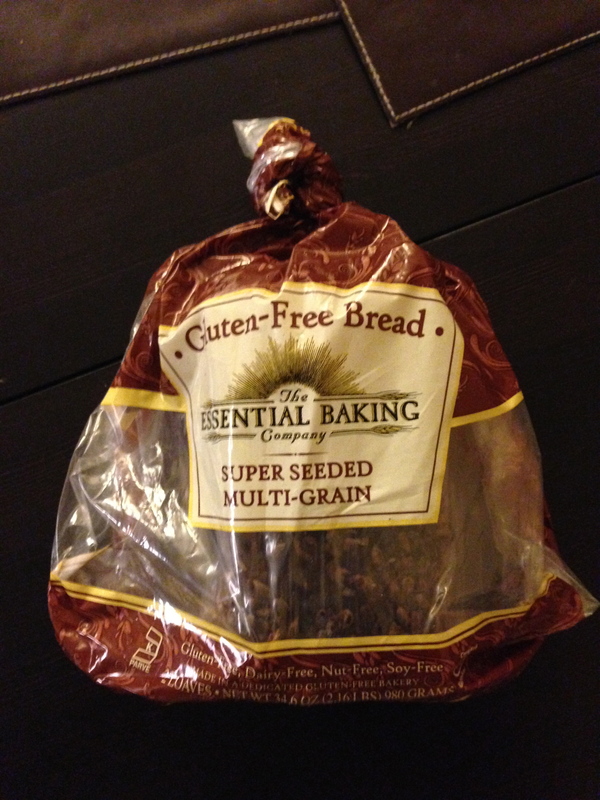 If you don’t like seeds in your bread (or at all), you will not like this bread. Since V and I both happen to like seeds, it tasted good to us. 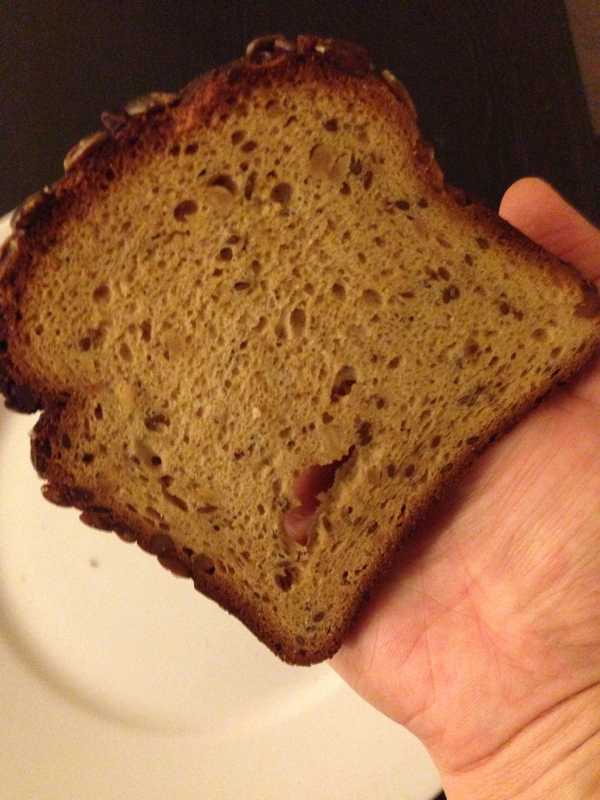 It’s a little dense like most gluten-free breads, but not noticeably any more than other brands we’ve tried. And here is the major winning point: it is not crumbly. Rudi’s bread tends to fall apart in sandwiches the longer you eat it, and it’s harder for a kid to manage to keep it together. We made a sandwich with mayo, cheese and lettuce in the evening. It sat in the fridge in the lunch bag overnight and then V took it to school. She was pleased to report that it did not fall apart when she tried to eat it. Yay for normal, natural ingredients. 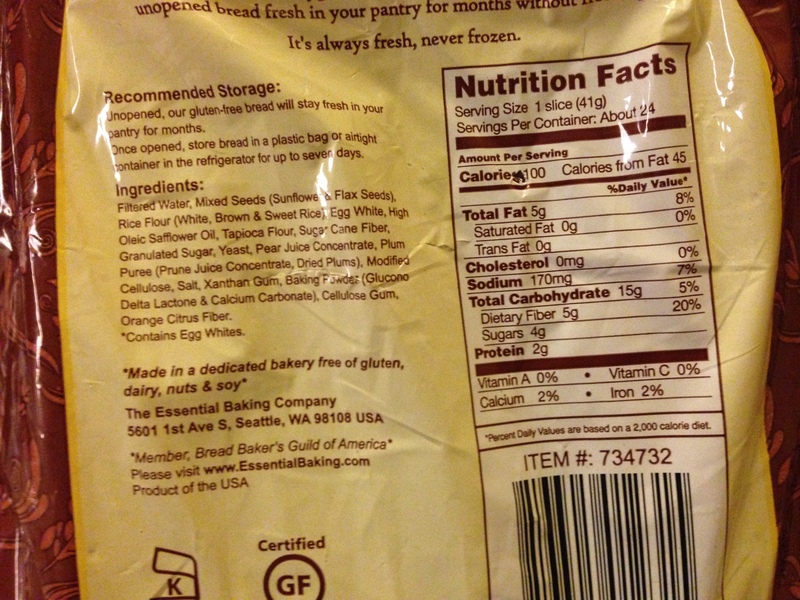 5 grams of fiber per slice? Yes please! Carb content is already decent at 15 g per slice, but subtracting the fiber makes it only 10g per slice. Not too high on sugar, and at 2 g of protein per slice this is a true complex carbohydrate. I’ve seen this bread at two local Costco stores and it is sold as a two-pack for $8. It’s an average price for GF bread and a $1 more than Rudi’s. It is sold in sealed bags and fresh (not frozen or refrigerated). Instructions say to keep it in the fridge after opening but we’ve kept it out in the kitchen for nearly a week now and so far it tastes just fine. Of course the weather has been cooler, so perhaps it will need refrigeration in the warmer months. I asked V to give me a full report after she took the first test sandwich to school. She said it was great because “It tasted good, was easy to take out of the bag, it did not fall apart when I ate it, and I got to eat sunflower seeds with my sandwich!” If you like multi-grain breads with seeds, you will probably like this one. If you like a plain textured bread, this bread may not be for you. It gets a thumbs up from us based on good taste and texture, excellent nutritional value and low carb count. When we started our research on pumps, we quickly narrowed it down to two: Omnipod and Medtronics. Omnipod offered awesome tubeless technology, but the drawback was that they had issues with quality and customer service when they rolled out new pods, and the control device (aka PDM = Personal Diabetes Manager) would have to be carried with V at all times. And you know how kids are – they loose things, they forget things. Medtronics pump, on the other hand, would be still attached to V at all times and while it presented inconvenience in terms of needing to be disconnected for showering, physical activity, changing, etc. and would be a learning curve to get used to something attached to your body at all times, it was very and intuitive to use, had a stellar reputation, and we would not have to worry about V loosing it. And the new pump also came with the integrated Continuous Glucose Monitoring (CGM). Let’s talk CGM for a minute. This technology came a long way in the past few years. You wear a sensor at all times and it takes continuous blood glucose levels. It will alert you when you are dropping or when you are going over your high threshold. It will show you patterns and now only tell you what your current BG is, but also if it’s trending up or down and how fast. This allows you to make much better choices in terms of your BG management and helps you to really tighten your BG range and prevent ups and downs. Pretty cool! When we started our pump research, we did not understand the value of CGM for us, as V has not (YET) have to deal with extreme swings, or severe hypoglycemia. So we thought it was not something we’d even be interested in. Then, the more we learned, the more we felt it would be useful, and then realized that no, we don’t want it. We NEED it. And we need it yesterday. With all of the physical activities V is involved in, we have a hard time keeping her numbers in check. We’ve seen her drop from mid 200 to low 60s in a matter of 45 minutes. Or shot up from normal range to upper 200s. Or see the effects hours after activity is over. And as much as we try to stay on top of it it’s still a hit or miss. CGM would allow us to get a much better understanding of what is going on and act preventatively when we know where her BG is trending. Also, while CGM does not replace finger pricking before meals, it would eliminate it during the night when we need to check when she’s already asleep and/or monitor closely. So now CGM is front and center in our decision making. As I mentioned. Medtronics has intreated CGM technology. The sensor communicates with the pump and shows BG values and trends on the pump screen. One device does it all. With Omnipod, we’d need to get a separate CGM device, specifically the Dexcom. Now it would mean two devices to carry around. So just go with Medtronics integrated technology, right? Wong. Problem is that Medtronics CGM sensor has been quite problematic. There have been many complaints about it being painful, uncomfortable and inaccurate. They came out with a new sensor a few months ago and we were hoping it would solve the problem. But as we kept reading reviews and talking to people, while there indeed seem to be improvements, there are still many complaints. And when people try both Medtronics and Dexcom they all say that Dexcom is better, more comfortable, more durable, more accurate. And yet, because the new sensor is so new, there is not a whole lot of info on it out there from users who’ve worn it for a while or were able to try it and Dexcom for comparison. And everyone who uses Dexcom loves their Dexcom. You’d be hard pressed to find a negative review of it. So here we are, at the major crossroad with CGM as the decisive factor, which is not something we expected just a few weeks ago. If Medtronics CGM had as stellar reputation as Dexcom in terms of comfort and accuracy, we’d be definitely willing to trade the convenience of tubeless pumping for a streamlined and integrated CGM/Pump technology. Unfortunately, from everything we’ve gathered it looks like Medtronics has a top-notch pump with a substandard CGM. And we feel very uncomfortable committing to it for 4 years. Since CGM is integrated with the pump, the insurance will only cover it once every 4 years. Dexcom is only a one-year committment and can be used with any pump. If new and better CGMs come around, we won’t be able to try it if we are stuck with Medtronics. So I guess we are back on the Omnipod bandwagon. At what point do we stop scouring the internet for reviews and articles? At what point do we stop asking people to tell us their experience? At what point enough is enough and we are ready to make our decision? Are we reaching the point of diminishing returns, where the more we read the more we get confused and paralyzed? We need to decide literally in the next couple of days. We want the insurance to cover all of the technology this year as it would be a lot cheaper than waiting for next year, with the deductible and out of pocket maximum starting anew. It takes a few weeks to get an authorization. Is it time to take a big breath, make a decision and just go with it? Whatever pump and CGM we choose, it’s bound to be better than what we have now. Right? RIGHT?? ?